“Despicable Me” lacks a franchise to ride into town on, but it may establish one. I'm not sure how Gru can think up anything more sensational than stealing the moon, but I'm sure Dr. Nefario is working on that as we speak. The film is funny, energetic, teeth-gnashingly venomous and animated with an eye to exploiting the 3-D process with such sure-fire techniques as a visit to an amusement park. The sad thing, I am forced to report, is that the 3-D process produces a picture more dim than it should be. “Despicable Me” is technically competent and nowhere near the visual disaster that is “The Last Airbender,” but take my word for it: Try to find it in 2-D. Or, if you see it in 3-D, check out the trailers online to see how bright and cheery it would look in 2-D. How can people deceive themselves that 3-D is worth paying extra for? Ah, yes, Patient Zero of that odious yellow infection. I think I may have seen the last half hour of this while visiting family, so I am in no way qualified to discuss the film on its own merits, but the long banana-babelling shadow it has cast on pop culture is unavoidable, and should be noted. The sad thing, I am forced to report, is that the 3-D process produces a picture more dim than it should be. Imagine how much everyone in the world hates the minions. Now imagine that hatred balled up into a single dot, the size of a flea. Now imagine that that flea is on the ground floor of the Willis Sears Tower. In this allegory, the Willis Sears Tower is approximately 1/10th of how much Roger Ebert hated how the 3-D process made films darker. I have never hated anything as much as Ebert hated that, and I have had people try to blow me up. So this is the thread where everyone hates on the minions? Ok, fine. I too have noticed Roger Ebert's vehemence toward 3-D movies. While I can't say the darkening is even something I would notice, I don't like them for the simple reason of having glasses. There's just no good way to put theater 3-D glasses over or under prescription lenses. 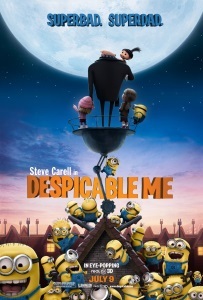 Ebert was right that Despicable Me would launch a franchise. Though, perhaps, it would have been better if it hadn't. While I won't be re-watching this until later tonight, I recall the film was engagingly enjoyable and am looking forward to a pleasant viewing. I feel that this movie and Austin Powers share a lot of similarities, in that they are both low-key comedies with a surprising amount of heart. Then they both spawned a series of sequels that completely failed to replicate the aspects of the originals that made them good movies. They are monstrosities borne of capitalism, one of the many horrors for which we must rebuild the guillotines. "I have never hated anything as much as Ebert hated that, and I have had people try to blow me up." "Explain, please? *raises the eyebrow of curiosity now*"
Probably because Etrigan NEVER rhymes. Anything. Has it been that long since I had to swing my veteran credentials around? I still use 'IT'S SOOO FLUUUUFFFFFFY!" To try and express any moments of squee fandom where I am genuinely delighted at a thing. As the parent of a five-year-old I get to see a lot of the DM movies, as well as the Minions stand-alone film. Interestingly this one is the least demanded.